I received the pieces I have from my Grandma. Unfortunately, she doesn't remember how or when she purchased them. Guardian Service Cookware are durable cast aluminum pots with aluminum or glass lids. They are easy to identify because both the pots and the lids are marked with the Guardian Service logo: a knight's helmet. Because I enjoyed using these pots, I started searching for information about the history of the cookware. While looking, I noticed that it was still a popular cookware today, with around 200 listings per day on eBay (see link at bottom of site). It is a testament to their quality and durability. While searching for information, I ran across an article from the April 1985 issue of Hobbies Magazine about Guardian Service. 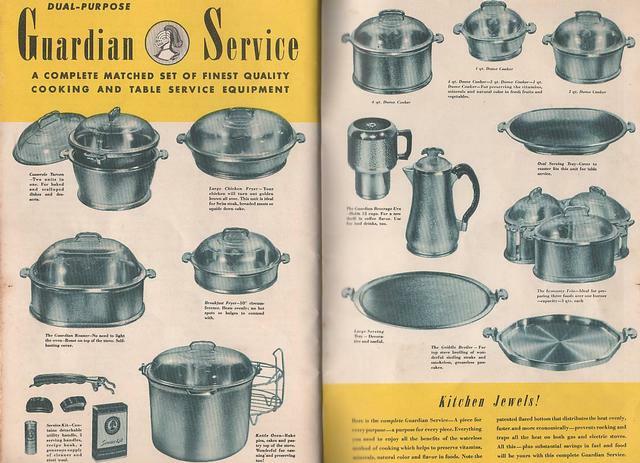 From this article I learned that Guardian Service cookware was manufactured by the Century Metal Corporation in Los Angeles, California between 1935 and 1955. From 1935-1939 the cookware was manufactured with aluminum lids, but to conserve aluminum during World War II, the lids were later made with glass. The cookware was sold through home demonstrations. I also found Marie's Guardian Service Page. It has quite a few pictures of the cookware and accessories including many rare pieces. If you are looking for Guardian Service cookware or replacement parts, take a look at eBay. They average about 200 listings on any given day.